Linda McKinney is a myrmecologist, a scientist who studies the social structure of ants. Her academic career has left her entirely unprepared for the day her sophisticated research is conscripted by unknown forces to help run an unmanned - and thanks to her research, automated - drone army. Odin is the secretive Special Ops soldier with a unique insight into the faceless enemy who has begun to attack the American homeland with drones programmed to seek, identify, and execute targets. Particle physicist Jon Grady is ecstatic when his team achieves what they've been working toward for years: A device that can reflect gravity. Their research will revolutionize the field of physics - the crowning achievement of a career. Grady expects widespread acclaim for his entire team. The Nobel Prize. Instead, his lab is locked down by a shadowy organization whose mission is to prevent at all costs the social upheaval sudden technological advances bring. By day, Angie, a 20-year veteran of the tech industry, is a data analyst at Tomo, the world's largest social networking company; by night, she exploits her database access to profile domestic abusers and kill the worst of them. She can't change her own traumatic past, but she can save other women. When Tomo introduces a deceptive new product that preys on users' fears to drive up its own revenue, Angie sees Tomo for what it really is - another evil abuser. Angie Stumps Goliath: 15 Stars! David Ryan is the designer of ELOPe, an email language optimization program, that if successful, will make his career. 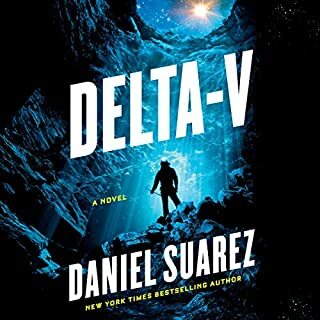 But when the project is suddenly in danger of being canceled, David embeds a hidden directive in the software accidentally creating a runaway artificial intelligence. David and his team are initially thrilled when the project is allocated extra servers and programmers. In the near future, the nano-drug Nexus can link mind to mind. There are some who want to improve it. There are some who want to eradicate it. And there are others who just want to exploit it. When a young scientist is caught improving Nexus, he’s thrust over his head into a world of danger and international espionage, with far more at stake than anyone realizes. Neal Stephenson, "the hottest science fiction writer in America", takes science fiction to dazzling new levels. The Diamond Age is a stunning tale; set in 21st-century Shanghai, it is the story of what happens what a state-of-the-art interactive device falls into the hands of a street urchin named Nell. Her life, and the entire future of humanity, is about to be decoded and reprogrammed. 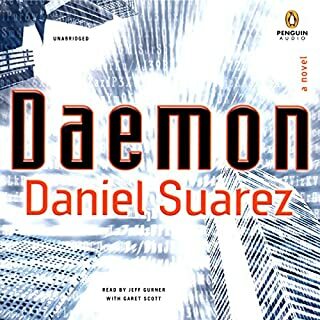 The propulsive, shockingly plausible sequel to New York Times best seller Daemon. 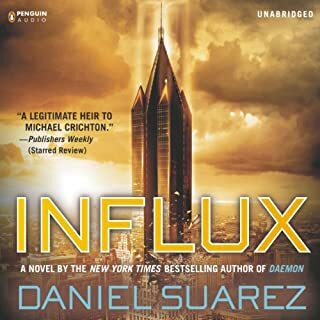 In one of the most buzzed-about debuts, Daniel Suarez introduced a terrifying vision of a new world order, controlled by the Daemon, an insidious computer program unleashed by a hi-tech wunderkind. Daemon captured the attention of the tech community, became a New York Times and Indie best seller, and left listeners hungry for more. Well, more is here, and it's even more gripping than its predecessor. 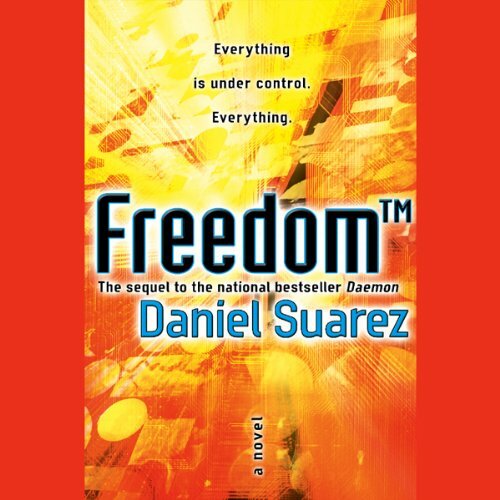 In the opening chapters of Freedom, the Daemon is firmly in control, using an expanded network of real-world, dispossessed darknet operatives to tear apart civilization and rebuild it anew. Soon civil war breaks out in the American Midwest, in a brutal wave of violence that becomes known as the Corn Rebellion. Former detective Pete Sebeck, now the Daemon's most powerful - though reluctant - operative, must lead a small band of enlightened humans toward a populist movement designed to protect the new world order. But the private armies of global business are preparing to crush the Daemon once and for all. In a world of conflicted loyalties, rapidly diminishing human power, and the possibility that anyone can be a spy, what's at stake is nothing less than human freedom's last hope to survive the technology revolution. 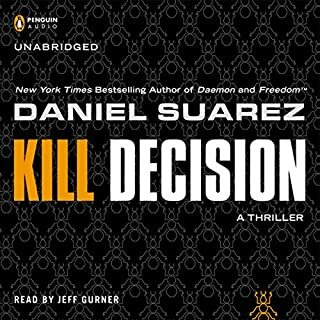 I picked up Daemon with this month's credits and as soon as I finished it I knew I wasn't going to be able to wait for until next month's credits to listen to Freedom and bought it immediately. Definitely the right call! A Great Continuation of a Great Story! I am probally the audience this was written for so, no suprise, I liked this story alot. The character are well defined, you feel for them as they struggle and overcome the odds. I recommend this to everyone I know as it is a great geek book. One of those books that leave you wondering how someone can be smart, imaginative, and informed enough to come up with this plot and story. This is the the part continuation of the book Deamon which was also awesome. It moves quick, is bloody, and it makes you think (more than the first book) about many current issues, our political views, and where we are going. Great action. Edge of your seat page turner. Loved it. Reader is fab also. A clever ending to a great sci-fi tale. This is a great sequel with the presumably fitting end to a remarkably unique sci-fi thriller. It is fast paced and kept me guessing throughout the novel. I really liked the ending. The reading was excellent, worthy of the novel. I read the original printing of Daemon when it came out and felt like I was left high and dry waiting for the sequel. Then the book got picked up by a major publisher and my wait got extended even further. I gnashed my teeth at the thought. When I finally saw that FreedomTM came out and was on audiobook, I was hesitant. I decided that I was just being childish at having to wait and clicked the button. Years of rusty memory of the book was suddenly cleaned off by the first few lines of the book and I was definitely happy that I was on a long drive. Not only does this book finish off the best piece of hacker fiction that I have ever read, but it also made me feel good in the end. This book gives hope for mankind in a way that I never expected when I finished the first book of the sequence. 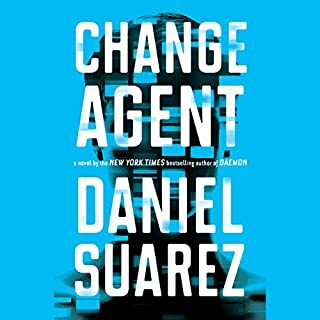 I look forward to more work from Daniel Suarez. The Best Geek Story EVER! I lost sleep to finish the story. I was afraid that the sequel might not hold up to the strong beginning, but instead, it was even more satisfying. Should be read by all concerned with the potent threats to democracy that the misuse of technology can create. To those who go on in this book, the question posed by Matthew Sobel at the end is thrilling. Daniel Suarez is to be congratulated on his thought-provoking classic. The Audible rendition is wonderful. The readers are great and the special sound effects augment the text well. 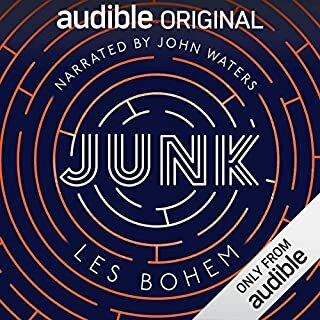 I didn't want to stop listening to this book. There are few books where I find myself sitting in my car not wanting to leave and finding reasons to drive somewhere... just to hear the story. Both books were awesome! I can't wait for another one.